Remember when this thing got teased? It sort of worked as a marketing tactic, to spike interest leading up to the launch, but for a lot of us (misled by anxious rumors), the PXW-FS5 was a big disappointment because it didn’t take us all the way to a full-frame sensor, and it lacked internal image stabilization. 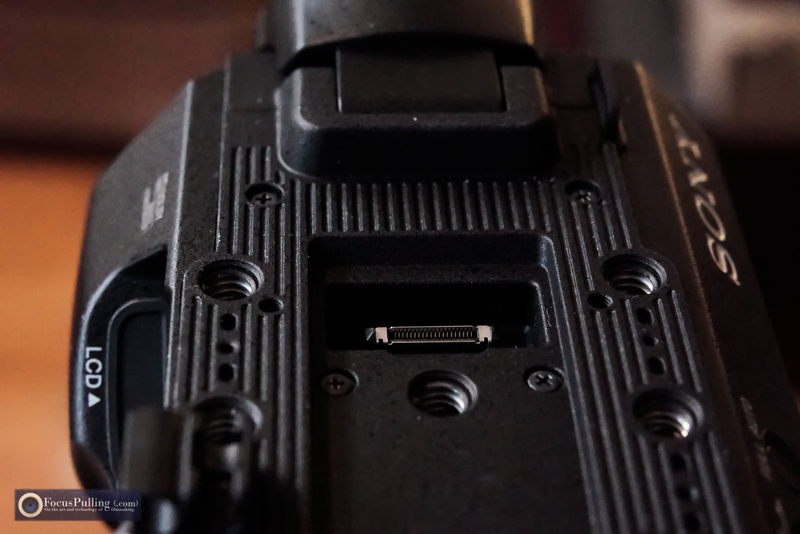 These were features we started getting on the a7R II (and soon, the a7S II), but having them in a proper camcorder form factor would have tamed the awful overheating defect in the a7R II (which turned out to be an embarrassing clerical error in the firmware, finally fixed), while also adding balanced XLR audio inputs and an array of manual controls instead of fiddling with ornery menus to do nearly everything. That would have been the real #MissingPiece! And still we wait. Is there anything brand new, never seen before, on the FS5? Yes! You can expect to start seeing it anywhere there’s room for an internal ND filter (and it’s even showing up in add-on peripherals). Instead of rotating two polarization filters that fight against each other, resulting in vignetting and even an X-pattern, this new invention is an electronic function (not only motorized). To begin with, you always get better results when you stack the ND filter behind the lens instead of at the outside, before the lens cap. 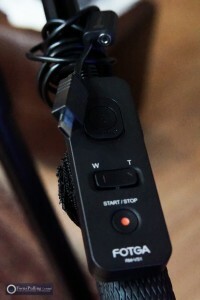 The fact that the FS5 crams this new feature into such a small body is brilliant. 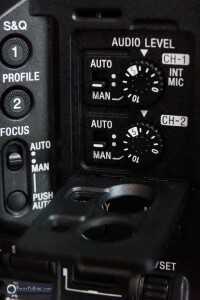 In practice, you can lock down your aperture and shutter speed, while setting ISO/gain to whatever works at the lowest lighting environment you expect to have, then simply ride the variable ND dial to adjust exposure as necessary, maintaining consistent depth of field and motion blur. I was worried that it would (like electronic aperture controls) clunk up and down in visible steps, but it doesn’t: the transitions from light to dark, and vice-versa, are smooth. And, as seen in the animated GIF at left, you can move the entire ND filter out of position to get a clear view, if you’re not using it, with just the press of a button. From the picture at right, you can begin to see how smartly the manual controls are laid out, including an inset from the rear leading to an angled column in the middle that cheats out to the viewpoint of the camera operator. The HOLD toggle works out to be a clever stress-reducer if you know conditions won’t change, and you want insurance: in the classic case, I love it during an interview, especially when it’s a crew of one (me). 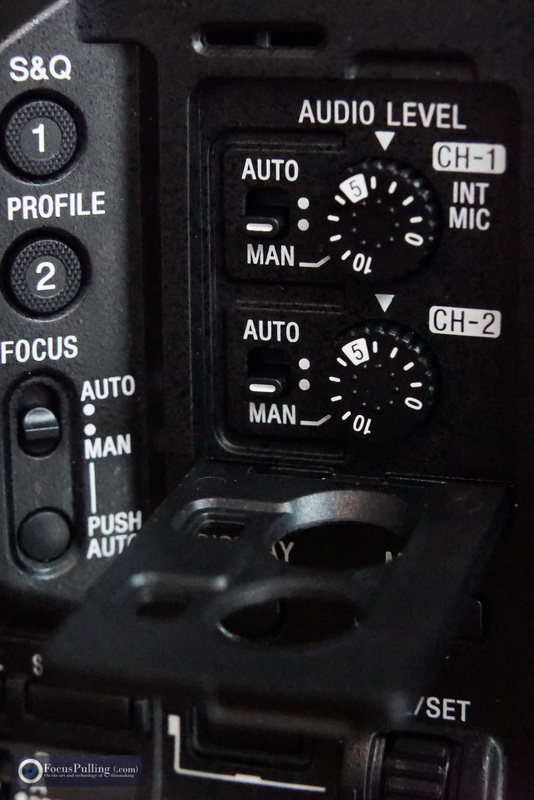 Another clever feature is the way that manual audio level controls are inset, but flattened by a latch so that you can’t accidentally nick them and send the audio into unrecoverable clipping. At right, you can see how the hatch opens up. Granted, it’s an extra step when you want to adjust audio levels on-the-fly, pulling down the hatch and flipping it back up when you’re done, but I’m glad to have it for protection. Well done! At the back of the FS5, you can see the included small battery, and the room to upgrade for longer life. 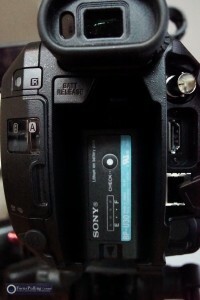 Although the battery format (Sony BP-UXX) is much costlier than the nearly-universal Sony NP-F used in the NEX camcorders, it adds the nice feature of an onboard push-to-check battery level meter. 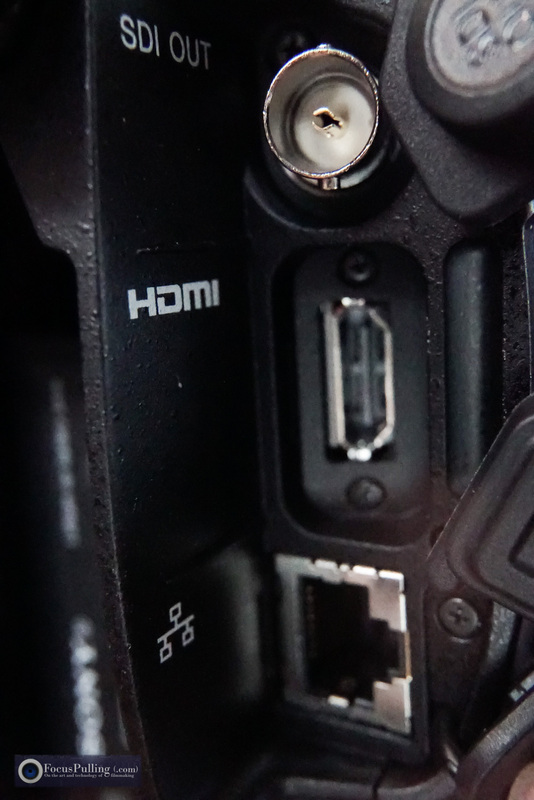 At right, you can see the SDI and HDMI outputs, as well as an Ethernet port for studio work (I’m not familiar with that feature, and apparently Sony doesn’t think we are either). 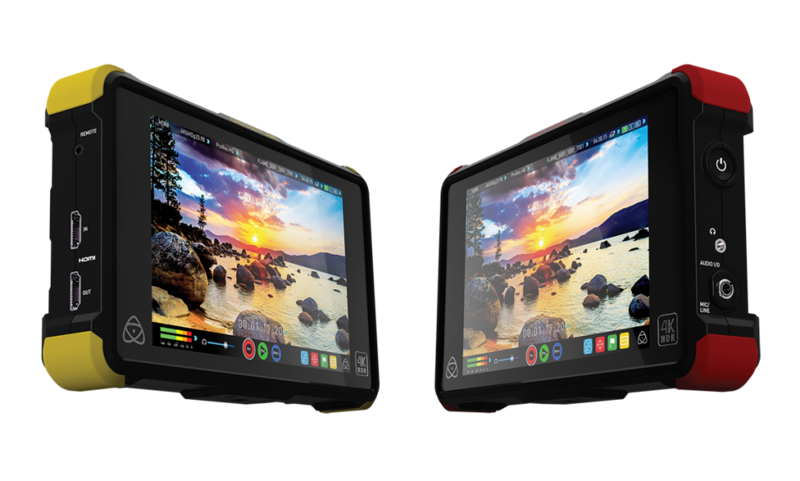 The outputs, though, sadly deliver a mere 8-bit 4:2:0 at full 4K/Ultra-HD, so even if you’ve got an Atomos Shogun capable of recording 10-bit 4:2:2 color, pooey on you. Notably, the older brother of the FS5, Sony’s PXW-FS7, outputs 10-bit 4:2:2 4K/Ultra-HD. 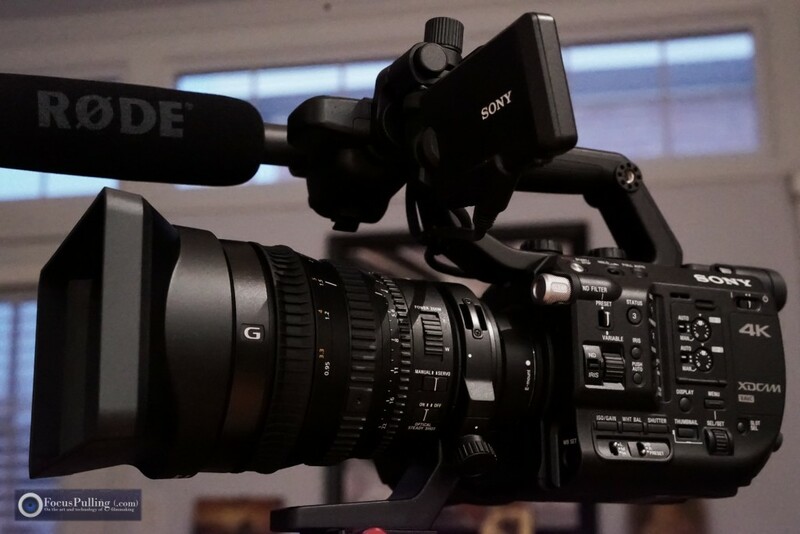 Unless seeing actual evidence otherwise, you can presume the usual hooey at play: Sony wants you to pay more for it, even though the FS5 could totally output 10-bit color without any significantly different hardware. 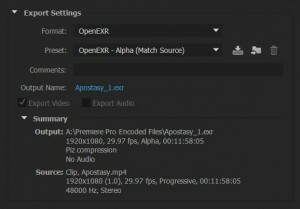 It’s true that the internal recording capability would be pushed past its limits with 10-bit 4:2:2 color for 4K/Ultra-HD, because the SD card write speed is a bottleneck (even at the minimum spec you need, UHS-I Class 3). 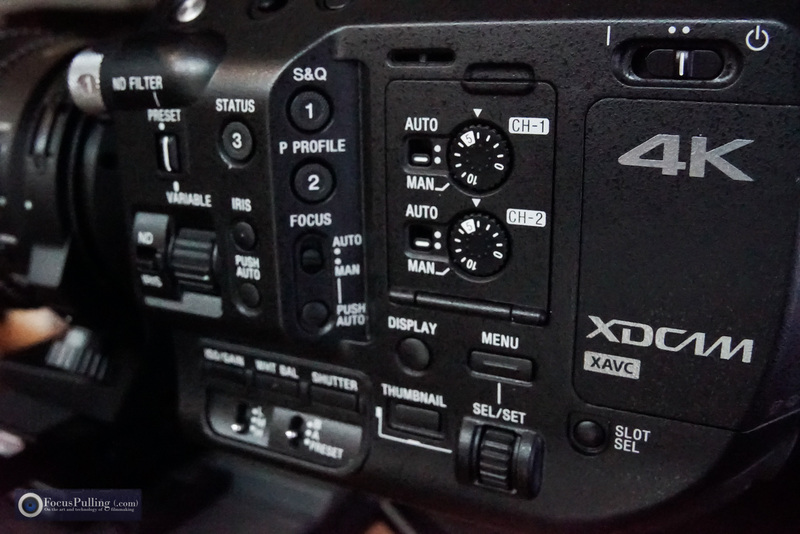 This explains why the FS7 requires astronomically expensive, proprietary XQD memory cards (that’ll probably get outdated faster than you can say “Sony Memory Stick”). 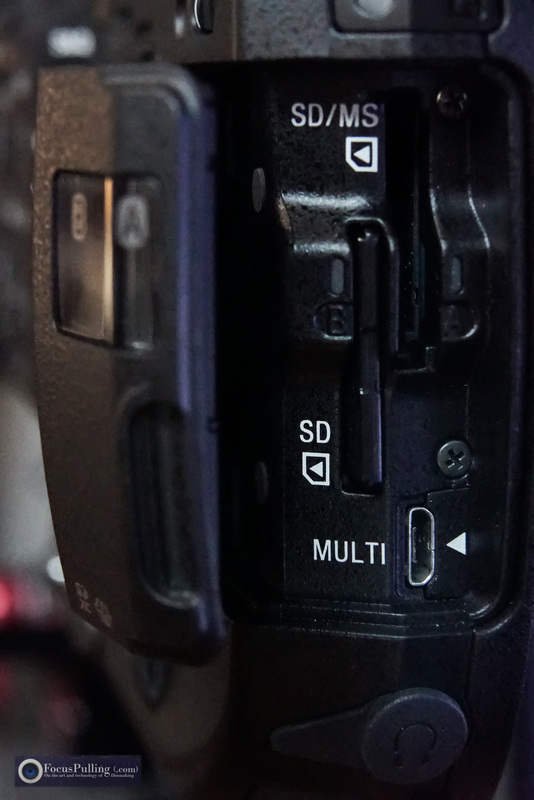 Speaking of which, the FS5 comically has one Memory Stick slot! And it’s 2016! When you’re done laughing at that, there’s also a pair of SDXC card slots. This buys you the choice of redundant recording to two cards at the same time for insurance, or relaying from one that gets full, on to the next one without loss. Nice for peace of mind. 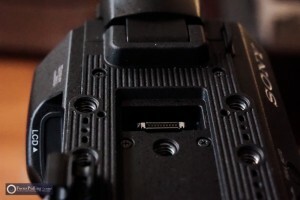 I was disappointed to find that the port labeled “MULTI” in the above-left rear view, which uses a micro-USB connector, didn’t work as expected. 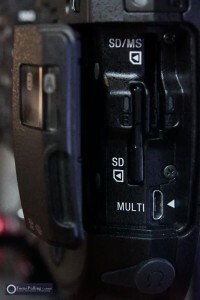 When I plug the remote control seen at right into my a7S II’s port also labeled “MULTI,” I can control an attached power zoom lens, start/stop, and power. After digging into the FS5 menus and trying all possible combinations, no dice. Sony needs to do a better job at clarifying what it’s for (and the product manual doesn’t say, besides analog video/audio output). Ergonomically, the center of gravity that epitomizes the feel of the FS5 is its innovative hand grip, as seen in the gallery above. Improving upon the FS7’s that was fundamentally designed to be extended from a shoulder-mount configuration, this one thrives on a rosette (non-ARRI) that lets it pivot to your sweet spot. 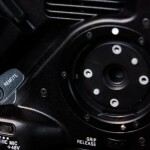 (The FS100 and FS700 were onto this, but never quite got it.) There are a zoom rocker, start/stop button and assignable controls, and you can remove the whole thing if, for example, you’re flying on a gimbal or need to slim down. 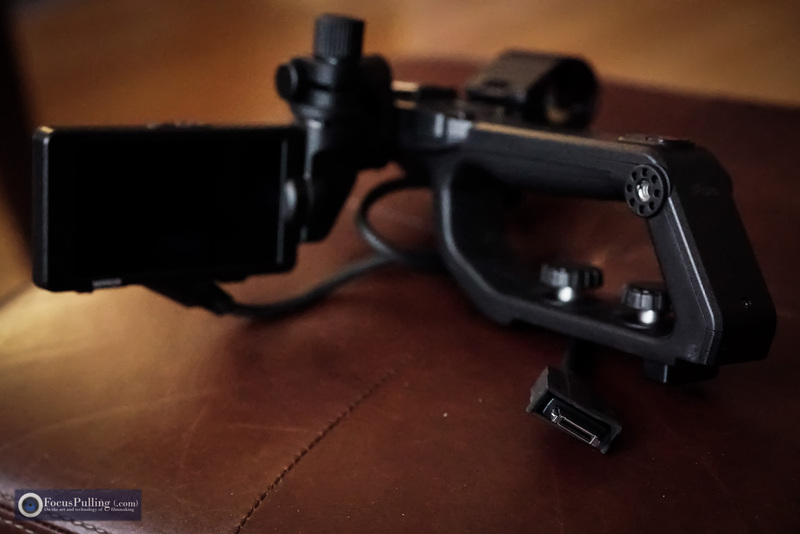 The cable management is great, and you can still relocate it via an extension arm like the FS7. Moving to the top, there are generous mounting points designed for custom rigs, and/or the included top handle with attached viewfinder display. 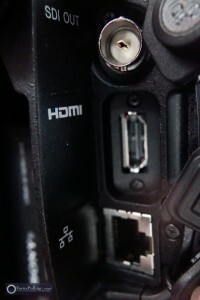 In the picture at left, you can see the proprietary port that you can plug the viewfinder into, using the cable seen in the picture below/right, whether mounted onto the handle or somewhere else. Sony gives you generous options for where to locate all this stuff, more than I’ve ever seen. You’d think that companies like Zacuto would have nothing to add, but they do: the viewfinder ain’t great, and unlike for the FS7, Sony doesn’t give you a loupe to magnify it and isolate it from unwanted light. 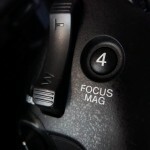 (The other, rear loupe/viewfinder may be adequate in a pinch, but not enough to pull focus accurately.) So, the one must-get accessory for the FS5 is Zacuto’s new custom Z-Finder. Sony also includes a boom microphone holder on the handle, but unlike the NEX camcorders, they don’t even include a microphone that fits (not that you’d want it): but if you use a non-Sony-proprietary boom mic (e.g., the great Rode NTG-4), it’ll slip out. 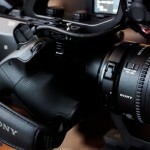 Like Memory Stick and A-Mount, Sony just won’t give up on this one. It’s been driving us crazy for years, and they don’t even sell their simple rubber adapter sleeve at retail to make any standard microphone fit snugly. The best you can do (and believe me, I’ve scoured the field) is to buy a bunch of rubber rings made by Sanken, and avoid nasty thoughts as you load up the mic shaft. 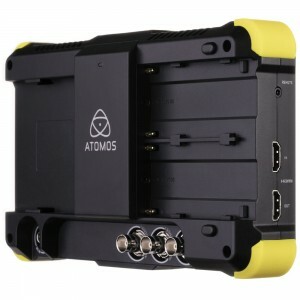 When it comes to rigging up the FS5, my primary concern was how to get my Atomos Shogun hooked up, in a modular way so that I could quickly break things down, or go hand-held and back, or switch out gear. I went with Zacuto’s Gorilla Plate v2 that is the quick-release base for many of their products, including the extension arm that’s seen at right. 15mm rods are a fast and sturdy way to quickly mount stuff and make adjustments. Worked out great. 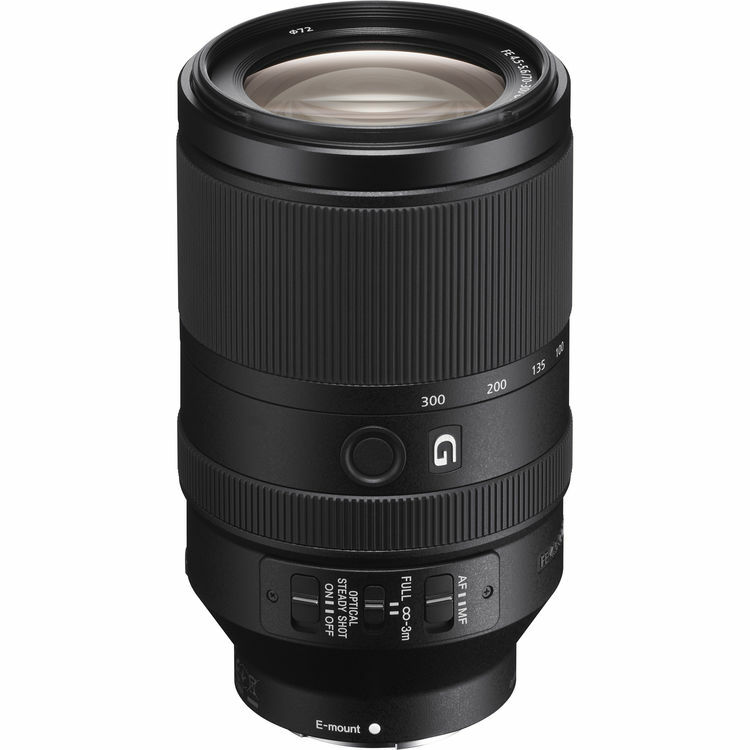 You’ll also see that I mounted my monstrous Sony 28-135mm f/4 cine lens, which as a full-frame lens is a little long for the FS5’s crop sensor, starting at 28mm. But when you have less freedom of movement and might be shooting from a farther distance anyway (e.g., music performances), it’s a killer combination that far exceeds the capability of the kit lens you can buy with the FS5. 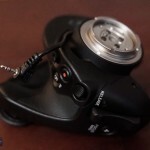 Its hard focus stops, parfocal mechanism, clickless manual aperture control, continuous aperture, and wide barrel are a killer throwback to the way lenses should always be. Having picked at some of these details, the real measurement for a review is field use! I’m sold on S-Log3 combined with the simplicity of dropping FilmConvert onto camera footage for a rich and easy LUT, making results similar across different camera types. 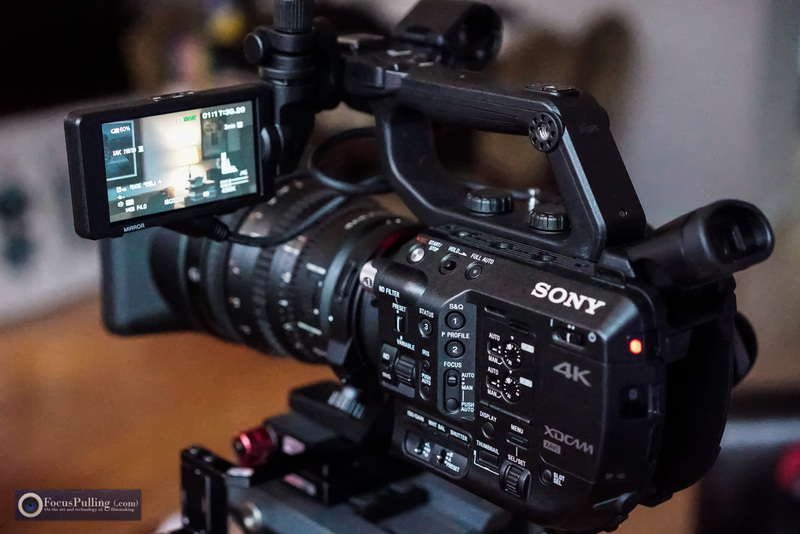 Thus, the FS5 can be a great companion to another S-Log3 shooter like the Sony a7S II. 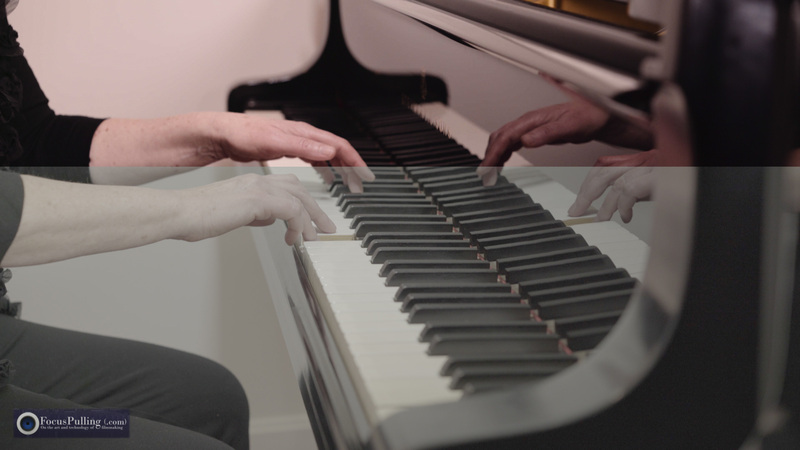 That’s the pair you see above, in the studio of renowned piano interpreter and pedagogue Immanuela Gruenberg, where we created a series of tutorials on Béla Bartók’s “Ten Easy Pieces” for worldwide distribution by a major publisher — the first in a series. 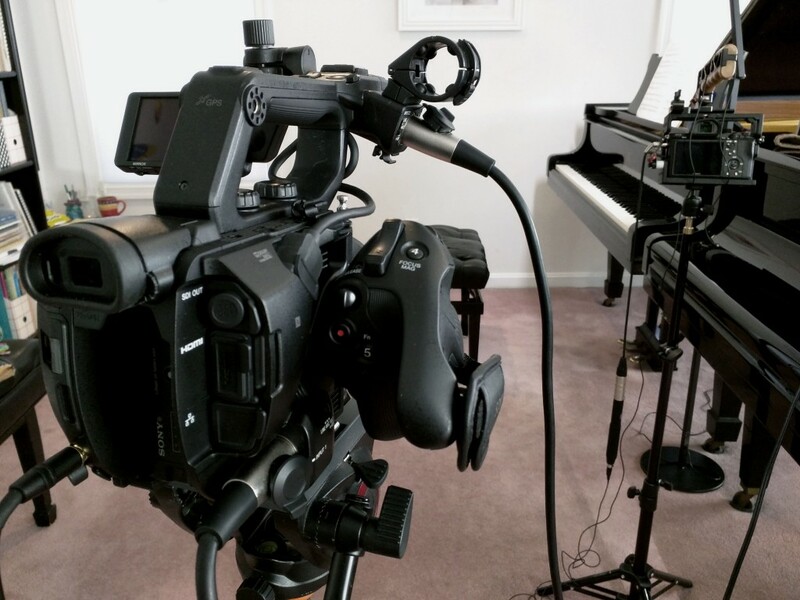 The FS5 is dedicated to 4K/Ultra-HD capture of the wide shot (with the option to crop in for a medium shot), and the a7S II is dedicated to 4K/Ultra-HD capture of the piano keyboard (with the option to crop in for a close shot of her hands), while the final output is 1080p. This is where the severe limits of the XAVC-L codec comes in, especially given Sony’s lock-down of 8-bit 4:2:0. It’s supposed to be a little better than the a7S II’s XAVC-S codec, but it doesn’t matter: if you’ve got slight shifts of color and brightness in your shot, you’re at risk of macro-blocking and tearing. It’s the perfect storm of ingredients: (1) 8-bit 4:2:0 suffers because it captures less gradients between one color and the next; (2) 100 Mbps is too slow of a bitrate to crunch 4K/Ultra-HD numbers on-the-fly; and (3) all the flavors of XAVC are terribly lossy compression. Granted, it’s neato that you can shoot for hours onto a single cheap card, and spare the massive archiving expense of RAW terrabytes from a single shoot. 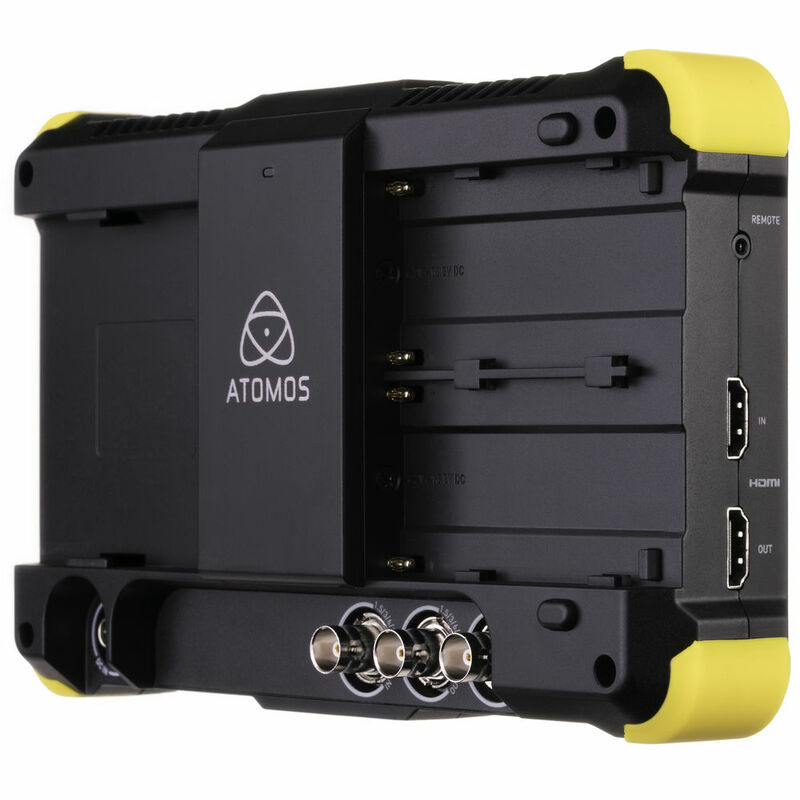 But we aren’t even given the option to improve the situation with hardware upgrades (e.g., the Atomos Shogun), because one bottleneck can bring everything else down — and again, Sony handicapped the outputs of the FS5 and a7S II. Is this all just a horde of theory? Nope. 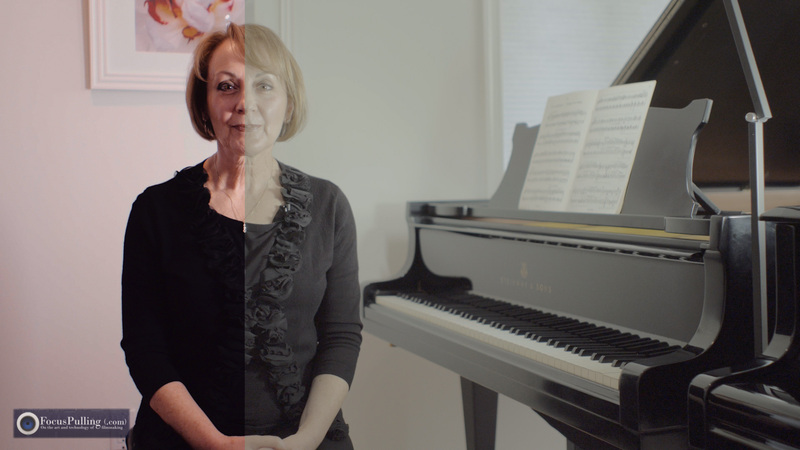 In the gallery above, there are ungraded S-Log3 Cine gamma, and FilmConvert graded counterparts, at two zoomed-in trouble spots from the FS5 footage. This was before a recent FS5 firmware update that improved upon, but did not eliminate, the problem. (Sony had messed up its implementation of noise reduction on the FS5, considering that we noticed the a7S II actually performed better using its similar XAVC codec and S-Log3 colorspace.) In the first pair of before/after grading, you’ll see concentric rings of banding. And in the second pair, an abrupt cliff where grayish simply turns pinkish. And these bugs look far, far worse in motion, compared to stills, because macro-blocks boogie like a disco dance floor. Sony’s spin control on results like this was comical, usually delivered by paid evangelists. Generally, the theme has been: what the hell did you expect? 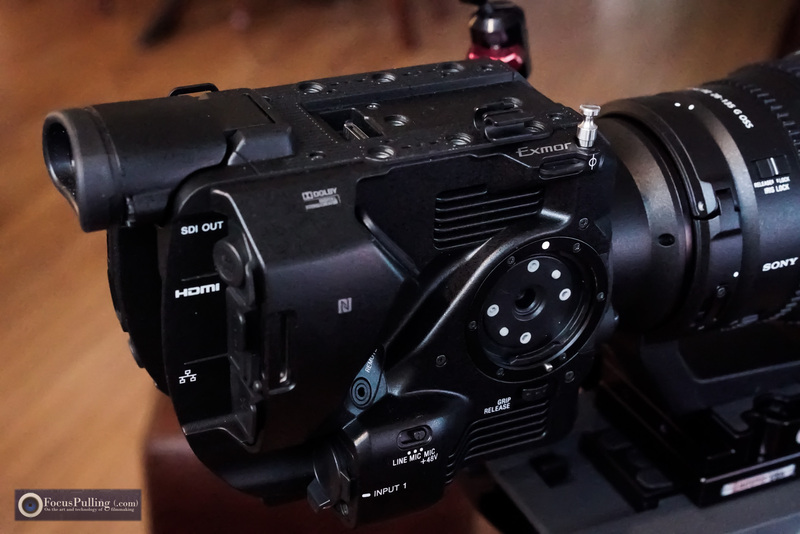 It’s not the FS7, it’s tiny, it’s cheaper than a CineAlta, the video ain’t RAW, etc. Funny thing is, the firmware update did improve (but again, did not eliminate) the problem, amounting to a belated admission. That “get over it” diagnosis didn’t turn out to be the end-all, be-all (just like the a7R II overheating product defect). We’ve got to keep our guard up! The solution isn’t to point our cameras away from anything with a gradient. The sky is not a limit! 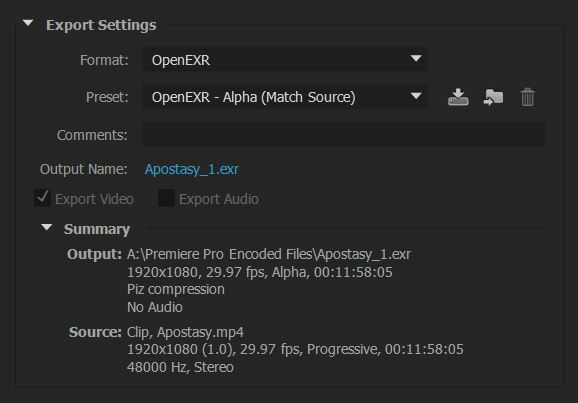 But still, for that perfect storm of ingredients causing the problem, you can eliminate its biggest factor by doing something simple (if it befits your final output): throttle down your resolution to 1080p, because there, you get 10-bit 4:2:2 internal recording. 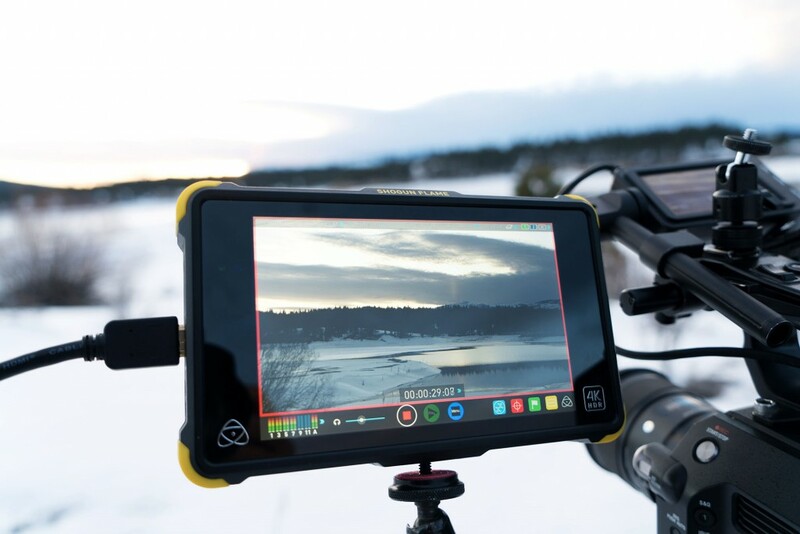 Even where your final output is 4K/Ultra-HD, if you’ve got a shot of the sky, etc., it’s a reasonable compromise to just drop in your shot at 1080p, and up-res it in post. After all, macro-blocking is a bigger pixel resolution downgrade than the gap between 2K and 4K! So, should you get this thing? Always the boilerplate answer: depends on your needs. 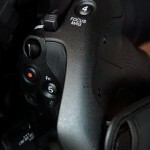 For me, I’m a little disappointed: I want a full-frame sensor, dammit! 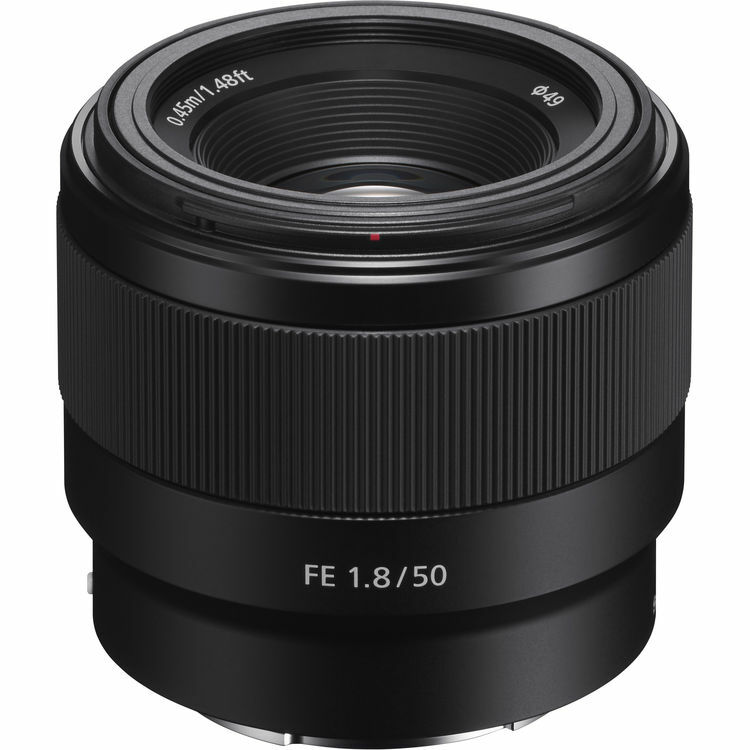 And when you think about it, Sony is migrating its native E-mount lens line-up to full-frame almost exclusively, so there’s no turning back. We’ve almost arrived at that destination, putting the a7S II into a proper camcorder body for doing real work (not fiddling around with menus and recording separate audio, as if we’re using a tourist camera to make serious films). For Sony to close the gap with, say, a 200 Mbps bitrate and 10-bit 4:2:2 capture is a zero-effort proposition. Blackmagic jammed that into their sub-$1k Pocket Cinema Camera in what seems like an eternity ago for this market. And with overpriced lenses increasingly skimping out on image stabilization, Sony has got to make up for it with in-body image stabilization across the product line. We’re almost there, Sony. 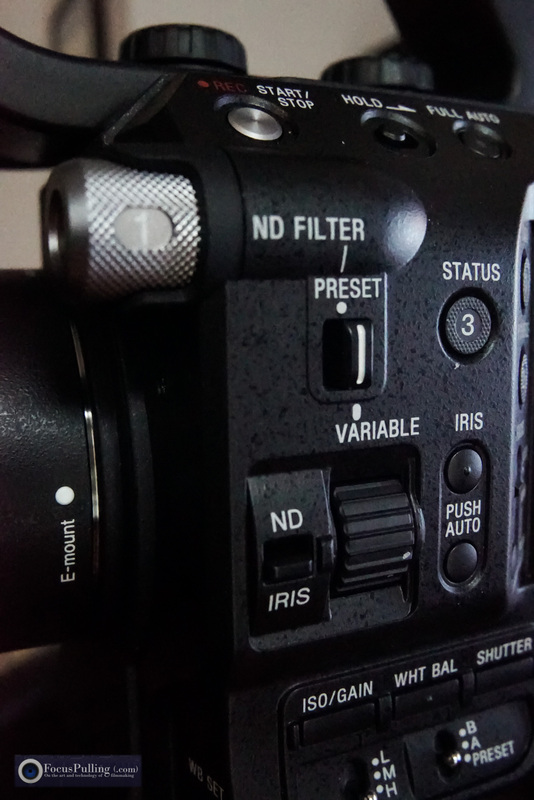 It wasn’t long ago that Panasonic was killing you with the GH4! What’s your next move? Please go to the Vimeo User Group at vimeo.com/groups/fs5 and click “Join this group” to share your videos. Also, “Like” the Facebook page at facebook.com/pxwfs5 and follow @pxwfs5 on Twitter at twitter.com/pxwfs5 for a daily stream of video samples, news, and deals. Thanks for getting involved! 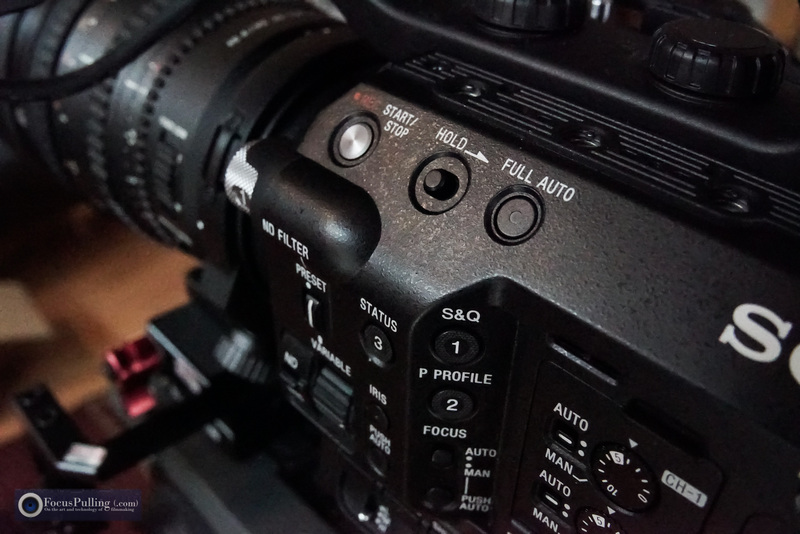 Did you know there’s a User Group for the Sony PXW-FS5 now too? It starts on this site with videos coming in from the community via its Vimeo Group you can JOIN, and a News & Deals section here too that you can follow, with social streams of the same content on Facebook you can LIKE and on Twitter where you can FOLLOW @pxwfs5. Join up! [NOTE: This offer is now expired. 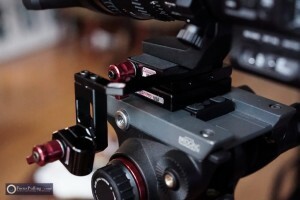 You can get the product at Zacuto’s own store, or at B&H among other online retailers. Over the past month, I got to know the FS5 well (full review coming soon here), but one thing I knew from the start was the need for a better viewfinder, because that one sticking out the back just doesn’t cut it. 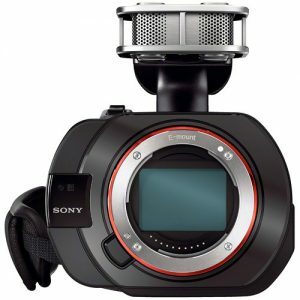 And compared to the FS7, Sony has left off a removable loupe/eyepiece for the larger and better flip-out monitor, which seemed like a strange omission, because it would be just as useful on the FS5. 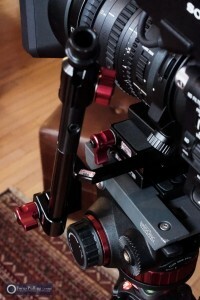 Now Zacuto has stepped in and designed their new custom Z-Finder, as seen in the above video and below picture. 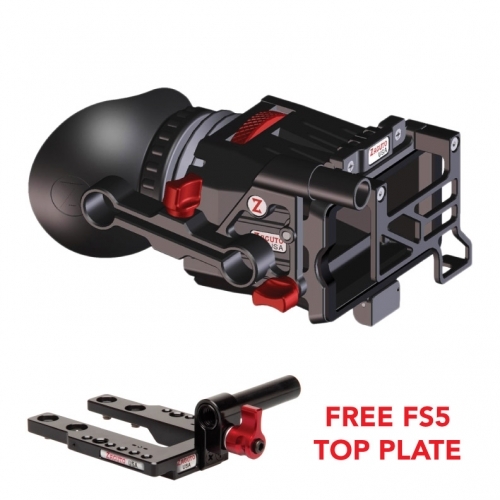 I love the way it mounts onto the plastic rod that Sony already gave you, but if you want more strength, for a limited time they are giving away a Zacuto top plate for free, included with this new Z-Finder as seen here. 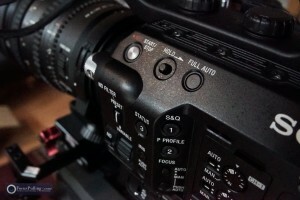 Trust me, I don’t work for Zacuto, and I’m not assuming this is right for you. But when they contacted me offering an exclusive group buy, I figured: that’s one of the reasons the User Group exists to begin with. Their terms are to collect names of people wanting to commit to this big discount (unavailable elsewhere, and you might know that Zacuto pricing is any other way the same, whether buying direct or from B&H, etc.). If the total reaches 10, one big discount kicks in; if the total goes past 20, a further discount kicks in. Let’s get to 20! Shouldn’t be difficult at all, with so many of you seeing this from the Interwebs. Just send me a message in the contact form below, or shoot an e-mail to groupbuy at focuspulling dot com, and in reply I’ll let you know the precise discounts. After that, if you reply confirming your commitment, I’ll pass that along to Zacuto who will issue you easy instructions as the product launches in late February. They’re the ones who will safely collect payment and process your order, at their own online store. I’m just hooking you up, and if you want the number to reach 10 or 20 for the best discount, please share this post with other FS5 users you know. Happy shooting!